knows the right questions to ask--but how? Author's notes follow the story. People talk about it, but no one uses the word "haunted." earth's fate depended on the outcome of the World Series. saved up: I don't expect we'll see her for a while. between his collar and Adam's apple, but he doesn't speak. Agents, this is Colonel Ed Robbins." I leave when Helen does. I've heard Robbin's story already. men's room with the sports section. The desks are battered--painted a sloppy, gun-metal gray. over the Bunsen burners in today's labs. the next conflict. It won't be a happy surprise. Than he's any right to be." his presence. He doesn't react. They seem to forget that there's no evidence of a crime. "Thank you. We'll speak with each of you individually,"
group's good name. Will you be starting with Mr. Barnes?" "No. We'll speak to him last. We'll start with Mr.
"Fine. Drew, you go first. Do you want to go next, Marge?" their final report hasn't already been written. We'll see. "What does 'EOS' stand for, Mr. Kestler?" Mulder asks. give me a brief explanation of its purpose?" investigation." Drew's lips purse up with smugness. Some times I get this twinge after eating." They'd better not let him get started on his twinges. "Actually my partner here is a..."
show Ms. Barnes being waved through the gate at that time." to help Stan break down his cutaway of an interurban." had a shower before I went," he explains. "May I see your access card?" Agent Mulder asks. "Have you ever told anyone your PIN?" Agent Scully asks. soothes him. "How well did you know Rebecca Barnes?" "So you liked her?" Agent Mulder asks. anything for alcohol. And I'm ready to defend my property." "I understand you live quite a distance from the base,"
it's any of your business. And Terri knows how to shoot." lying right outside Marge's cubicle." Agent Mulder jumps in again. "That puzzles me, Mr.
her. Or I'd have reported her missing." answer. "Well, you see... They'd separated. Sort of. they've been abducted by aliens. room with Steve. I'm surprised to see him return with Jay. "What did you do?" Scully prompts. hospital to get an ambulance. I knew it was too late." every time she received treatment." she could." Jay sounds so understanding. were doing experiments on her connected with MY work!" Jay puts on his martyr's look. tantrum and drive off. She always ended up at her father's. She didn't have anyplace else to go." evidence of a conspiracy?" Mulder asks. when I least expected it!" manages. "I know this has been very difficult for you." "Shall we talk to... " Mulder begins. "Let's get Angie Phillips in here!" Scully snaps. I miss something in that interview?" "I'll go get her." Agent Scully answers without answering. "How long have you been intimate with Mr. Barnes?" seeing each other about three months ago." says, without looking up from Angie's folder. that's what you're thinking. He felt sorry for her." his wife and marry you?" "Marry me? I... No! We didn't have any plans... ."
Agent Scully's voice takes on a hard edge. "Come now, Ms.
marriage bed, weren't you? ADMIT IT!" married. It was just... propinquity. You know?" propinquity, it doesn't please her. between Jay Barnes and Angie Phillips." desk. She looks up into her partner's face with confidence. be having a hunch. You have hunches all the time." solves a problem before I'm aware of the process." voice in your head? Or just a feeling?" outside of me. Mulder, is that how it was for you?" "I'm fine," she says quickly. "No, really--I'm fine." folder in front of her. "So, who are we interviewing next?" "Please, I must have silence to concentrate," she intones. She's having a hard time keeping a straight face. Scully's eyes go wide and she gasps. "Why 'Daddy'?" she almost pleads out loud. off. Do you need to talk to me before I leave?" what were you saying about Mr. Eberhardt?" Marge's face shines with benevolent superiority. "Mr.
forty-five years. Now he's a contractor." 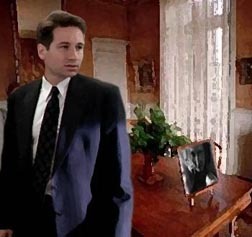 "Where's Eberhardt's folder, Scully?" Mulder interjects. "Are you worried about your own safety?" Mulder asks. "Ms.
have any reason to believe that you're in danger?" reappearing?" Marge is definitely showing some temper. she's here. And the cold spots. Haven't you felt them?" and sometimes it happens. Sometimes I'm not strong enough. Who ya' gonna' call? I think. Ghostbusters? "If he's on the project, Eberhardt has an access card,"
head snaps up from "Security Policies and Procedures, pub. stop myself, I think--I should go with them. "That's not what the map says," Mulder objects. "It's a shortcut," she assures him. the front walk. I'll never need a house again. How odd. told me you were on your way. I don't know how I can help." hidden away somewhere that says 'Do something about Becky. "Mr. Eberhardt... " Mulder begins. Daddy frowns in concentration. "Of course," he says slowly. me too fast," he stalls. "I must have lost it," he informs the agents. there was a scientific conspiracy against her." "I know what caused that," Daddy says calmly. satisfaction out of being right, that it's almost as good. believes that, it doesn't make him innocent. any other place else you could have left your card?" forty years ago, instead of two weeks. "Maybe the bedroom,"
With my flaws gone, there wasn't much personality left. the way he... . "
"Hmmm. Ah. I see," Scully remains unenthusiastic. "But she's not really dead, it turns out... "
post-mortem on her body last night." forty years. I still can't figure out who I am without it. I think he's sorry he killed me. "Did you argue often, Mr. Eberhardt?" Scully asks. wing chair with a deep sigh. "Then I'd write her a check. to make it stop? Temporary insanity..."
boils down to one question. Was it my fault?" anything out, she didn't tell me." "Do you have the doctor's name and address?" "I wasn't touching it," Mulder protests hurriedly. any conditions. It's not right to outlive your child." to a doctor who wasn't familiar with my case. "Dr. Miller," Scully calls out. file. Now I don't know what to say." mistake, and I can't explain it." but her results were impossible to interpret." "May I see?" Scully asks. "Come back here and look," the doctor invites. know it's a picture of chromosomes, but it looks odd. from a fetus with triploidy." phenotype. Ms. Barnes appeared to be normal." "Unless she were a mosaic?" Scully suggests. "Her medical history wasn't normal," Mulder remarks. associated with triploidy--multiple, lethal abnormalities. mention of the removal of her ovaries," Scully inquires. "What? She'd had an oophorectomy?" had an operation for female troubles somewhere else." hospital. He told me I'd die if someone else treated me. I'd have agreed to a brain transplant to stop the pain. Dr. Miller snorts out one loud "Ha!" "Dr. Miller," he says. "What about this incident in 1984?" no injuries, except for minor bruises and abrasions." started to ask hard questions?" criminal means when she threatened to blow the whistle?" theories in the course of an investigation," he soothes. "I'm sure a scientist like you understands that." 'female problems?' I need to talk to him." "I didn't understand the message. Something about a flood. Is it a plumbing leak?" he inquires. They answer "No" in unison, and then everyone goes quiet. "Yes, thanks. We'll be in touch if we have more questions." of yours. Let's talk about this for a minute." she climbs in, as though she's listening for something. apology in Scully's voice when she speaks. to talk to Mr. Eberhardt." now, I'm sticking with him. "I think that's a dead end," she answers with a grim smile. anything I'd want to hear. It's hard to get over the habit of being limited. a whiskey. It's early yet for Daddy to be that far gone. "No thanks, Mr. Eberhardt," Mulder says. "My partner and I visited Dr. Miller," Mulder begins. is it if you don't foresee the problems? It doesn't matter. You do the best you can." focuses suddenly on Mulder's face. is, just as long as it's healthy.'" having a test tube baby." "Sir, the first test tube baby wasn't born until 1978." they'll always say JFK was shot by a lone gunman." published about other things, I've got my suspicions." new sadness in Mulder's tone when he speaks. next day. Bill didn't turn up at the hotel bar that night. I assumed his meetings were over." implanted?" Mulder is regaining some of his usual cool. "If that's right, why don't you tell me what happened?" It's funny how good Mulder is with the people he can see. made the excuse that the technology hadn't been perfected. he's not getting it. He goes off on a tangent. "It happens to a lot of unwary people," Daddy snaps at him. drive Becky's car back. Her nerves were shot." "Sir, did her car start when you got there?" I don't listen anymore, because I already know the answer. third post-mortem on Rebecca Barnes?" opportunity to advance medical knowledge." "We need trustworthy policewomen. And military personnel,"
even though I don't have a body anymore. like to be on the verge of creating a new species!" "Please explain what that means,Colonel," she invites him. acids," he charges ahead, ignoring her severe expression. "It's our genes that determine what proteins are produced. jets and parts for trucks." chromosomes in Rebecca Barnes' karotype." "So. You're telling me that you've experimented on a human. You haven't published. You haven't shared your discoveries. "Don't let the personal prevent you from being objective. happened, it didn't seem real. waved the folder at him and spoke the words I'd planned. I'm not giving up. I'll find some way to get to Mulder. "What the hell?" Daddy says. his chair. He's been putting on an act for Mulder. Scully? I can't hear you." "What are you doing?" Daddy yells at Mulder. he's panting as though he's been running. "It's an entity." "I want you out of here!" Daddy shouts. way," he calls out a minute later. "Stand under the basket," he calls out to Daddy. "Please. Just stand there," Mulder gasps. for me to let you in." shouts after him. I know she can't leave the desk. wall." Mulder is almost gagging on the words. His eyes, and the colonel's, are streaming with tears. now, is flip this switch." on its side. There's a sinister hiss of gas escaping. She'd suffered enough at the end. It was painless..."
moment there's no separating myself from the golden energy. side to find out what's happening. needed." A smile as thin as paper stretches her mouth. ideas about where we could find evidence?" "Maybe it won't be that easy, Mulder," Scully consoles him. "Barnes' ova were lost with Colonel Robbins in the fire. strongly worded in condemnation of Robbins' experiments." deterrent. A haunted project won't attract or keep workers. "Mulder. It's over. There won't be any more experiments,"
"What? How do you know? Did a little birdie tell you?" isn't sensitive, but he means well. what I've learned this time. End of "Closed Colony, Special Stock"
Written especially for: I Made This Productions, Virtual Season 8.